He’ll go up against Kelsea Ballerini, The Chainsmokers, Maren Morris, and Anderson .Paak for Best New Artist. Chance The Rapper has not hidden how much he wants a Grammy. First he was buoyed by a change to the rules which saw streaming-only releases like his Coloring Book eligible for the first time. Then, in October, took out an ad in Billboard lobbying for consideration. Today, December 6, he got his wish with not one, but seven nominations at the 2017 Grammys. He's up for Best New Artist alongside Anderson .Paak, Kelsea Ballerini, The Chainsmokers, and Maren Morris. Last year the prize went to Meaghan Trainor. Chance's Coloring Book is nominated for Best Rap Album where he'll compete against De La Soul's And The Anonymous Nobody, DJ Khaled's Major Key, VIEWS by Drake, Kanye West's The Life Of Pablo, and Blank Face LP by ScHoolboy Q. 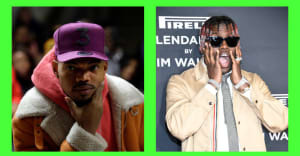 The remaining five nominations come for Best Rap Song ("No Problem") and Best Rap Performance ("No Problem"), plus for his contributions to Kanye West's "Ultralight Beam" in the Best Rap/Sung Performance category, and again for "Ultralight Beam" and "Famous" for Best Rap Song. You can catch up on all the major Grammy catgories here. Beyoncé leads the pack with the most nominations this year.